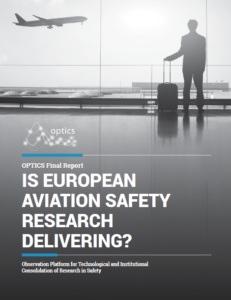 OPTICS started in 2013 to determine if Europe was doing the right aviation safety research towards a safer future, in accordance with the goals set by Europe’s vision for aviation, Flightpath 2050. Four years later, OPTICS has analysed 243 safety research projects, and many of these are moving us in a safer direction. In addition, OPTICS ran annual workshops where experts discussed research priorities, coming up with a list of urgent and strategic research needs, several of which have since been funded by the European Commission. Then, OPTICS turned to harder questions. Is the funded research helping to resolve Europe’s top aviation safety risks? And is the research-to-industry business model working well? Europe needs to become more strategic in its safety research, and ‘tighten up’ its business model. But overall the review is positive, and Europe is already on a good track. There are lessons to be learned from the answers to the questions above: read the final report OPTICS produced to present its overall conclusions.